In Dutch oven, heat 1 Tbsp canola oil over medium-high heat. Add chicken and cook about 3 minutes per side or until it begins to brown. (Center will still be slightly pink.) Remove from oven and set aside. Add remaining 1 Tbsp canola oil, onion, carrot and celery. Saute for 5 minutes or until just beginning to lightly brown on edges, stirring frequently. Add water, bay leaves and pepper flakes. Bring to boil over high heat. Reduce heat to medium low and simmer, covered, 20 minutes or until vegetables are tender. Stir in chicken, beans, tomatoes, Italian parsley, rosemary and salt. Cover and cook 5 minutes or until tomatoes are tender and chicken is cooked. 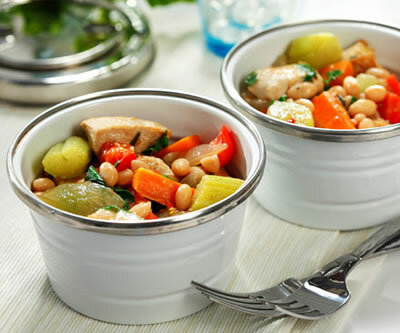 Here’s a great one-pot meal to warm and soothe a hungry, weary body after a hard day. Source: Recipe by Nancy Hughes. Recipe and photo appear courtesy of Canola Info. Men: What Eating Group Are You In?